The ONC is the department within the U.S. Department of Health and Human Services that is in charge of Meaningful Use and promoting EHR use. NIST is the agency within the U.S. Commerce Department that is in charge of creating the Meaningful Use test methods that EHRs use to certify on. The agency creates standards for several other areas as well, including the Security Controls and ID Proofing needed for Electronic Prescribing of Controlled Substances (EPCS). The HITECH act was signed into law in 2009 and is the act stipulating incentive payments be paid for Meaningful Use to eligible providers. CDS can be a number of different tools in an EHR that offer healthcare providers patient-specific information to aid in their clinical decisions and is one of the requirements for attesting to Meaningful Use. A good example of CDS is showing a drug-drug or drug-allergy alert when a provider selects a drug that could have an interaction for the patient. CPOE is the process of electronically entering medical orders, instead of on paper charts, and is also a requirement for attesting to Meaningful Use. A prime example is electronically entering a prescription, instead of writing it out by hand on a prescription pad. HIE is the electronic exchange of health information. It allows health care providers and patients to access and share a patient’s health records electronically. One of the main goals of Meaningful Use Stage 2 is to increase HIE between providers in order to increase care coordination and patient outcomes. The C-CDA format is a specific format standard that allows EHRs to exchange patient data with each other. In our last post, we covered why Meaningful Use is so big in 2014. When talking about Meaningful Use, there are a lot of terms and requirements that are thrown around and it can get quite confusing. This week we delve a little deeper into some of the main terms and requirements for meeting Meaningful Use. Meaningful use attestation is the process of demonstrating that an individual or organization is meeting the requirements in order to qualify for the federal government payments. They must prove (attest to) that they are meaningfully using a certified EHR. Providers are required to register and attest using the Centers for Medicare & Medicaid Services (CMS) website. As we mentioned last week, there are three different stages to Meaningful Use and providers must attest annually to whichever stage they are on. There are three sets of requirements providers must attest to at each stage: core objectives, menu objectives, and clinical quality measures. Each stage of Meaningful Use has its own set of Core Objectives that a provider must meet and attest to. All Core Objectives are required and have a specific measurement for each objective that must be achieved. For Stage 1 there are 15 Core Objectives and for Stage 2 there are 17 Core Objectives. As providers move on to the next stage, the measures get higher and/or include more requirements. Stage 2 Measure: More than 50% of all permissible prescriptions, or all prescriptions, written by the EP are queried for a drug formulary and transmitted electronically using CEHRT. In addition to the Core Objectives, providers also have to meet and attest to a set of Menu Objectives. Not all Menu Objectives are required, and providers are allowed to choose a certain number from the set. In Stage 1, providers must attest to 5 out of 10 Menu Objectives, with at least 1 public health objective selected. In Stage 2, providers must attest to 3 out of 6 Menu Objectives. Measure: The EP performs medication reconciliation for more than 50% of transitions of care in which the patient is transitioned into the care of the EP. Stage 2 Menu Objective: Record electronic notes in patient records. Measure: Enter at least one electronic progress note created, edited and signed by an EP for more than 30 percent of unique patients with at least one office visit during the EHR reporting period. As of 2014, all providers have to report on the same CQMs regardless of what stage they are on. There are 64 CQMs categorized into six National Quality Strategy domains which include: (1) Patient and Family Engagement (2) Patient Safety (3) Care Coordination (4) Population/Public Health (5) Efficient Use of Healthcare Resources and (6) Clinical Process/Effectiveness. Providers must report on 9 of the 64 CQMs and they must cover at least three of the National Quality Strategy domains. Providers are only allowed to attest to CQMs that their EHR vendor has certified on, so some providers might have a lot less than 64 to pick from. Meaningful Use in 2014 – What’s All the Fuss About? “Meaningful Use” is one of the biggest healthcare buzz terms in 2014, so what’s all the fuss about? Our next series of blog posts is dedicated to answering this, and other questions, about Meaningful Use. Providers begin by meeting Stage 1 requirements for a 90 day period within the first year. Then, depending on the year they started, they must demonstrate 3 months or a year of Meaningful Use in their second year. Once a provider has achieved Meaningful Use under the Stage 1 criteria, they move on to Stage 2 for two years. Why is 2014 Such a Big Year for Meaningful Use? 2014 is the first year that Stage 2 criteria have been effective and any providers who began Stage 1 in 2011 or 2012 are now required to begin Stage 2. 2014 is the last year that a provider can start participating and earn any EHR incentives. If a provider starts participating in 2014, they can still earn up to $24,000 in incentives. In addition, providers must successfully demonstrate meaningful use by October 1, 2014 to avoid a 1% Medicare penalty in 2015. In 2016, the penalty increases to 2% and then increases again to 3% in 2017. In 2014, all providers are required to attest to meaningful use using only 2014 Certified EHR Technology, regardless of what stage they are on. Because of this, all providers are only required to demonstrate meaningful use for a 3-month EHR reporting period. This is to allow providers sufficient time to upgrade their systems to the necessary technology. This also means that all EHRs being used for Meaningful Use have to be recertified using the 2014 criteria by July 1, 2014 in order to allow providers to attest by the October 1st deadline. With only three states left to approve EPCS and a few others working on their final requirements, EPCS is gaining great traction in 2014. As more and more pharmacies come online every day, MDToolbox is excited to be at the forefront of helping HIT vendors and physicians take the next step – and send ALL prescriptions electronically. What states are we still watching? Arkansas, Montana, and Rhode Island are the three states where EPCS still remains unavailable as their state governments sort out the differences in the State Laws versus the DEA rulings. Arkansas made progress by passing Act 1331 in April of 2013 to clarify that electronic prescribing of controlled substances is permitted. Furthermore, the Arkansas State Board of Pharmacy had a public hearing scheduled to discuss the changes in February 2014, but it was postponed until March due to poor weather conditions. Rhode Island also passed a similar bill, SB 647, in June of 2013 which states, “A practitioner may sign and transmit electronic prescriptions for controlled substances.” However, further clarification is still needed from all three states before EPCS is allowed. Stay tuned as we will post any updates as soon as we get them! While Oregon is listed as allowing Schedule II-V substances to be sent electronically on the Surescripts map, Schedule II substances can actually only be legally e-Prescribed in emergency situations. A bill was introduced on February 3, 2014, that if approved would allow all controlled substances including Schedule II drugs to be electronically sent in non-emergency situations as well. All eyes are on New York as they are leading the way by being the first state to mandate that all prescriptions be sent electronically. It was almost a year ago that EPCS became legal in the state of New York. As of March 27, 2013, amendments to Title 10 NYCRR Part 80 Rules and Regulations on Controlled Substances went into effect, technically allowing providers in New York to electronically prescribe Schedule II-V drugs1. However, the actual implementation of EPCS has been slower than expected as the state of New York was overdue finalizing its registration process. Pharmacies and providers are still currently struggling to meet all the requirements. It was not until January 23, 2014 that Surescripts was able to turn on EPCS functionality for the State of New York. Currently, out of 5,579 registered New York pharmacies there are only about 850 listed as being able to receive electronic controlled substance prescriptions on the Surescripts network. As we mentioned in our post about the Evolution of EPCS, pharmacy software must go through a DEA Certification or third-party audit to verify they comply with the strict regulations put in place by the DEA and through a Surescripts certification. In addition, pharmacies in New York are also required to submit dispensing data for controlled substances using the American Society for Automation in Pharmacy (ASAP) format Version 4.2 or greater2. It is not only the pharmacies in New York that have to go through extra steps to use EPCS, the prescribers do as well. The New York State Department of Health, Bureau of Narcotic Enforcement (BNE) recently released registration packets that are required for each prescriber who would like to transmit electronic prescriptions for controlled substances. All prescribers must register their electronic prescribing software and be able to provide proof of a DEA certification or third party audit verifying the software meets the federal security requirements for transmitting controlled substance prescriptions electronically. The DEA requires that all prescribers go through strict identity proofing and receive two-factor authentication credentials for EPCS. Prescribers must attest that they have personally met these federal requirements when registering with the BNE as well. With the New York I-STOP Law mandating that ALL prescriptions be electronically sent by March 27, 2015 with limited exceptions, providers only have a little over a year to register and begin using EPCS certified software. MDToolbox is prepared and ready to help any providers meet this fast approaching deadline. We are currently offering free EPCS software tokens for a year to any providers that sign up. Check out our EPCS page and contact us at info@mdtoolbox.com for more information. Electronic prescribing of controlled substances (EPCS) is just starting to gain ground. The Drug Enforcement Agency (DEA) rule allowing prescribers to electronically write prescriptions for controlled substances actually went into effect over three years ago. However, its adoption has been slow. The need to be able to send controlled substances electronically is definitely there. Approximately 11% of all prescriptions written are for controlled substances and 90% of prescribers write prescriptions for such drugs1. If these prescriptions can’t be sent electronically, prescribers must handwrite or print them. This can be a big interruption and slowdown in a prescriber’s workflow. In addition, EPCS increases safety and decreases fraud. So why is it taking so long for EPCS to become a norm? 3) Something the prescriber HAS like a device or token separate from the computer he is prescribing on. E-Prescribing software and pharmacy software must go through a DEA Certification or third-party audit to verify they comply with the regulations. The IFR requires e-Prescribing software to have a two-factor authentication protocol, have access controls so only prescribers with the proper permissions can send controlled substance prescriptions, and put extra security and auditing measures in place. Pharmacy software is also required to have access controls and stricter security measures, as well as additional features to be able to receive electronic controlled substance prescription orders. In addition to the Federal DEA requirements, each state has their own laws and regulations concerning EPCS. While 47 states have approved EPCS, there is still a small percentage of pharmacies in each of these states that are able to receive electronic prescriptions for controlled substances. 2010: DEA IFR goes into effect and states begin aligning their rules with those of the DEA. 2011: Software vendors working to meet requirements. 2012: First e-Prescribing and pharmacy software vendors certified. Surescripts® reports a “modest number of EPCSs” transmitted in eight states as of May 2012. 2013: About 14,000 pharmacy stores signed up for EPCS in 44 states, but only about 1,000 prescribers nationwide using EPCS as of Mid-2013. Out of almost 70,000 total pharmacies and more than half a million e-Prescribing prescribers, the numbers of those using EPCS are still small. 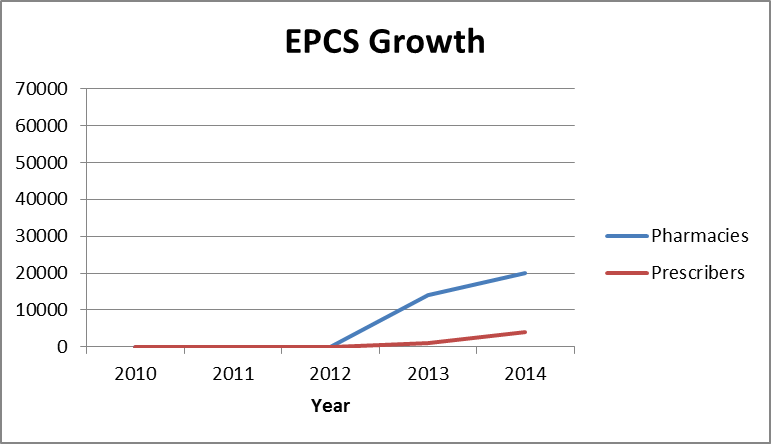 However, that’s changing as EPCS growth takes off. As one of the 14 certified Prescriber EPCS systems, MDToolbox is at the forefront of the EPCS movement. We see now as the time that EPCS is going to take off. MDToolbox is offering both standalone EPCS for prescribers and EPCS plug-in modules for EHRs looking for a quick and inexpensive way to get on-board with the movement. With laws like New York’s I-STOP mandating ALL prescriptions be sent by March 27, 2015, we believe EPCS will see huge growth in 2014. What do you think? We would love to hear from you and get your feedback, comments and questions. Leave a comment below or feel free to contact us at info@mdtoolbox.com. Rannazzisi JT. A Prescription for Waste: Controlled Substance Abuse in Medicaid. Drug Enforcement Administration (DEA). September 30, 2009. www.justice.gov/dea/pr/speeches-testimony/2012-2009/ct093009.pdf. Accessed January 27,2014. Electronic prescribing (e-Prescribing) has been praised for increasing patient safety by providing clearer prescriptions and reducing medication errors. Pharmacists no longer have to worry about interpreting the prescriber’s handwriting. However, it has been found that even with e-Prescribing, more than 10% of prescriptions still contain an error1. These errors can be highly dangerous, or even deadly. Here we list out our top 5 mistakes found in electronic prescriptions (e-prescriptions) and solutions to prevent them. One of the most dangerous medication errors is prescribing the wrong drug or strength. E-Prescribing prevents errors that occur from illegible writing, but incorrect medication errors can still occur. In many e-Prescribing systems, the prescriber selects the drug to prescribe from a lookup. It is easy to see how a rushed prescriber could make a mis-click and pick the wrong drug or strength. Additionally, several drugs have similar names. If prescribers are not careful, they can easily confuse them with each other. Of all medication errors, the FDA reports that about 10% come from drug name confusion2. Several drugs have different strengths and some have different dosage routes as well. For example, Ofloxacin is available in both a 0.3% opthamalic solution and a 0.3% otic solution. Choosing the wrong route could have serious effects. Selecting the wrong drug, strength, or route could even be fatal. This is why it is critical that prescribers double check these fields when selecting a drug to e-prescribe. A good way to prevent picking the wrong drug name is to use e-Prescribing software that includes tall man lettering to help in selecting look-alike drug names. These drug names include both lower and upper case letters in order to draw attention to the differences in their names. For example, two similarly named insulins are listed as NovoLOG and NovoLIN to differentiate between them. The directions must be written out fully in terms that the patient will understand. They should not include any abbreviations or anything that the pharmacist would need to interpret or rewrite. While pharmacists may understand the abbreviations, the reality is the busy pharmacist (or rather pharmacist assistant) will quickly re-write it or a computer program will re-write it for them and the translation is many times incorrect. These mistakes can be fatal. For example, the FDA reported a patient died when 20 units of insulin was abbreviated as "20 U," and the "U" was mistaken for a "zero"3. The patient received an incorrect dose of 200 units as a result. Using e-Prescribing software that allows prescribers to easily free text any custom directions needed, as well as customize their sig and direction lookups, is a great solution for preventing information being placed in the wrong field. Using these solutions, as opposed to solutions where prescribers can only select pre-structured directions or have to complete complicated extra steps to have detailed directions, is an ideal way to avoid this information from being unseen or conflicting. Another highly dangerous medication error is prescribing the wrong dosage. It is easy for a prescriber to make a mistake when converting units of measurement or calculating a dose. These mistakes can result in doses 10 or 100 times the intended amount. For example, an infant recently died after receiving an overdose of morphine when a 3.5mg dose was given rather than what should have been a 0.35mg dose. There have been many other cases where these kinds of mistakes have led to fatalities as well. This is why it is important for prescribers to check and double check the dose they are prescribing. A great solution for prescribers is to use an e-Prescribing system that includes dosing references and a dosing calculator at the point of prescribing. These calculators help prevent calculation errors and give warnings if the calculated doses are too high. These are especially useful for pediatrics per weight based dosing. In some systems, like MDToolbox, it will even convert mg per kg to mL automatically if needed for prescribers. Prescribers also make the mistake of including a quantity for either the number of days the prescription is for or the amount to be dispensed that is wrong in e-prescriptions. Prescribing more or less of a medication than intended can have serious effects. This is why it is important for prescribers to double check the dispense amount and the number of days it should last. It is important that these amounts do not contradict each other or the directions, otherwise the pharmacist will not know which is the correct amount. To further prevent quantity errors, prescribers can use software (like MDToolbox) that helps them with auto calculating these amounts based on the directions and either the selected number of days or dispense number. In addition to avoiding these mistakes, there are further steps prescribers should take to prevent medication errors. They should always take the time to double check the complete prescription information before hitting e-Send. Taking this small extra step can help catch a lot of unnecessary errors. Prescribers should also make sure that the patient is clear about which prescription they are prescribing for them and the proper way to take/use it. This way the patient can double check they are receiving the right prescription from the pharmacy and be able to use it as intended. Prescribers should also use e-Prescribing software that allows them to print patient leaflets, as well as a medication summary that lists the prescriptions to give to the patient. Medication summaries are a good way to remind the patient which medications were prescribed, how often to take them and which pharmacy they were e-Sent to. E-Prescribing continues to improve prescription safety. We can take patient safety to the next level and minimize medication errors even further with a combination of prescribers following a few simple guidelines, double checking their prescriptions and using patient safety focused e-Prescribing software. If you have comments or suggestions for our blog or would like to learn more about MDToolbox’s e-Prescribing solutions we would love to hear from you! Please leave a comment below, use our contact form or email us any time at info@mdtoolbox.com. Nanji KC, et al "Errors associated with outpatient computerized prescribing systems" J Am Med Inform Assoc 2011; DOI:10.1136/amiajnl-2011-000205. Rados C. “Drug name confusion: preventing medication errors.” FDA Consumer Magazine. 2005;39. www.fda.gov/fdac. "Strategies to Reduce Medication Errors: Working to Improve Medication Safety." U.S. Food and Drug Administration, 12 Apr. 2013. Web. 09 Jan. 2014. One of the biggest draws of e-Prescribing is increasing safety by providing alerts for adverse reactions. E-Prescribing systems can show warnings to prescribers for drug-drug, drug-allergy, drug-condition, and many other potential interactions. However, these alerts actually become a problem if they are shown too often. Prescribers start to have what is known as Alert Fatigue and completely ignore some or all of these warnings. If messages are constantly popping up, a prescriber is likely to pay less attention to them and simply override them to continue with their workflow. Studies have even shown as much as 95 percent of drug interaction alerts and 77 percent of drug allergy alerts are disregarded by doctors. This would not be such a huge issue if prescribers were only overriding low priority alerts. However, they are overriding high priority alerts as well. The problem comes from too many low priority and irrelevant alerts being shown. Imagine a doctor first receiving a low priority alert, then an alert irrelevant to the patient, then another lower priority alert, and so on. Doctors become so overwhelmed with alerts that they simply override all of them without taking notice of what they are, including those with the potential to prevent serious harm to patients. A recent study published in the Journal of the American Medical Informatics Association looked at the appropriateness of overridden alerts. Appropriate was defined as having the potential to prevent serious harm. The study found that 53% of all overridden alerts were appropriate1. It seems like a simple concept: To reduce alert fatigue, the number of alerts needs to be minimized. With so much alert information available, the challenge comes from deciding which alerts should be shown and which are less important. E-Prescribing vendors are also faced with solving how to display the important alerts in a manner that doesn’t diminish work-flow. Drug-drug and drug-allergy interaction checking is a criterion in both Meaningful Use Stage 1 and Stage 2. The 2014 Meaningful Use HIT Certification Program, approved by the Office of the National Coordinator for Health Information Technology (ONC), defines that drug-drug and drug-allergy alerts must both be automatically shown at the point of prescribing. The drug-drug alerts shown must also be adjustable by severity level2. This means that certified products should, at a minimum, be including the ability to minimalize minor drug-drug interaction alerts. This, however, does not cover severity level per drug-condition or drug-allergy alerts. A minor intolerance allergy alert should be treated different than a major interaction that can cause serious harm or even death. The ONC has also created a list of the most critical drug-drug interactions (separate from the Meaningful Use program). It has recommended that this list of 15 interactions be included in all prescribing systems and always generate an alert that cannot be turned off. Some have suggested that these alerts should also require more to override them then the standard alerts, such as a required written reason. It was also suggested that including these 15 alerts be a criterion for Meaningful Use of drug-drug interaction alerting. However, this list is said to only be responsible for less than 1 percent of drug interaction alerts in some systems. What about the rest of the alerts? The importance of alert types varies from specialty to specialty and even from doctor to doctor. This is why it is important for e-Prescribing vendors to have the ability to allow each prescriber to set their own customizable alert levels. Each prescriber should be able to select for each alert type (not just drug-drug) whether they want to see all of the available alerts, only the highest alerts, or somewhere in between in order to maximize the effectiveness of the alerts. It is important to categorize all alerts by their severity level and display this information in a clear and easy to understand format. If a prescriber has selected to see all alerts, it is still significant for them to know which are the highest alerts. Color-coding alerts so that for example, red is the highest, is a good way to make each alert level clear to the user. Alert fatigue can also be reduced by including all alerts for a given prescribing event together. Instead of having several individual alerts popup one after another, all alerts should be displayed in one window with the highest level alert displayed at the top. Review, overriding, or re-evaluation should never involve more than one or two clicks to continue with prescribing workflow. A lot of e-Prescribing systems categorize each alert by level of risk per one drug interacting with another drug, but what about interaction concerns per age, weight, or condition that increase the risk? At MDToolbox, we have taken it a step further and allow prescribers to create decision support interventions at the point of prescribing that can take into account other factors (like age, weight) when determining alert display. We also include optional dosing references, alerts and calculators to further aid in “smart alerts”. Instead of being viewed as a hindrance in the prescribing workflow, alerts should be viewed as an important safety aid. We hope that by reducing alert fatigue, the true effectiveness of prescribing medications with an alert system will be realized. E-prescribing makes it quick and easy for a doctor to prescribe a medication to a patient. However, doctors need to take extra precautions to ensure that they are not prescribing unnecessary medications too quickly. Prescription drug abuse is a fast growing problem in America. According to a study by the National Institute on Drug Abuse, approximately 7 million Americans abuse prescription drugs1. Furthermore, the CDC reported that in 2010, over 22,000 drug overdose deaths involved pharmaceutical drugs2. While the prescription medications can be obtained several unlawful ways (stealing someone else’s prescription or getting them through a drug dealer), a majority of them are obtained through prescriptions written directly for the drug abuser. Drug seekers will “doctor shop” to find a doctor (or multiple doctors) who is willing to write them a prescription for their chosen drug. 49 states (all except Missouri) have put a Prescription Drug Monitoring Program (PDMP) in place. These are electronic databases that prescribers can access to check a patient’s controlled substance prescription history within the state. These are valuable tools that can help reduce prescription drug abuse. Surescripts®, the nation’s largest e-Prescribing hub, also offers access to some Nationwide Pharmacy Fill History and Pharmacy Benefit Managers (PBM) claim history. For e-Prescribing software systems that certify on this feature and prescribers that take advantage of it, this is an invaluable tool. These tools can only help if they are actually used. Checking these databases is voluntary in most states. The Tampa Bay Times did an investigation in Florida on the actual use of their drug monitoring program. They found that out of 48 million controlled substance prescriptions written, prescribers had only checked the database before writing 2 percent3. There are only two states that have taken lead in making the use of these databases mandatory. In August, New York put into effect the I-STOP law which requires prescribers to check their state database before prescribing controlled substances. Tennessee also has a similar law in effect. In addition to actually using the databases, another key component to their effectiveness is that they provide current information. One more significant part of New York’s I-STOP law is that it requires real-time reporting by pharmacists dispensing prescriptions. The reporting requirements vary from state to state with only a couple requiring real-time reporting, some requiring reporting done within 24 hours and others only requiring monthly reporting. The PDMPs also vary from state to state as to which agency houses the database, which controlled substances are reported, who is required to submit data, and how noncompliance is enforced. Some states are able to share data with other states while others are not. And while e-Prescribing systems that offer access to the Surescripts® claims and fill history do allow for a nationwide accessible database, not all pharmacies and PMBs are in the network. More importantly, not all prescribers take the time to pull the history even when they have the tool. Be National – Each state having their own database is not the most effective model. Drug abusers can easily cross state lines or even move to a new state to get more prescriptions. The drug database information needs to be available nationwide. An e-Prescribing Vendor wanting to give their prescribers access to all data would currently need to integrate with 49 PDMP systems and Surescripts®. Be Mandatory – Every prescriber should be required to check the drug database. The information is of no use if it isn’t seen. Require pharmacy real-time reporting – Having the most current data available will prevent drug abusers from being able to get prescriptions from multiple pharmacies. Include all prescriptions – Schedules of drugs can be changed and drugs that were once non-controlled substances become controlled substances. A complete history of all prescriptions would be most beneficial to prescribers. This information is not only helpful in fighting drug abuse, it can aid in the overall quality of patient care. What Can Prescribers Do In The Mean Time? Until there is one central database or interoperability between all e-Prescribing systems and PDMPs, prescribers should ensure they use their state systems and in addition, that they are using e-Rx programs that make national drug usage information available. Programs like MDToolbox have access to the Surescripts® Nationwide Medication History through participating PBMs and pharmacies. While this is still limited to the PBMs and pharmacies in the network and not mandated, it does give prescribers one more tool to stop abuse and prescription shoppers. "Topics in Brief: Prescription Drug Abuse" NIDA, December 2011. “Opioids drive continued increase in drug overdose deaths,” CDC, February 2013. Keeping in line with our previous posts on the benefits of e-Prescribing software, this week we focus on the benefits of integrating e-Prescribing software with existing healthcare software programs like EHRs/EMRs (Electronic Health Record Systems and Electronic Medical Record Systems). While several options exist for integration, here we concentrate on embedding certified e-Prescribing screens. E-Prescribing requires a lot of data. One of the main reasons to use an e-Prescribing vendor is so that the EHRs don’t have to worry about the data upkeep. For example, MDToolbox provides a complete drug database that is updated monthly, a database for interactions, monographs and education materials that is also updated monthly, formulary information based on patients’ insurance plans that is updated weekly, and a pharmacy lookup that is updated nightly. See more about MDToolbox’s e-Prescribing services. E-Prescribing is a big part of certifying for Meaningful Use. By adding an e-Prescribing system that already meets Meaningful Use, EHRs can focus their time on meeting the rest of the qualifications. See which Meaningful Use criteria MDToolbox meets. It can take countless development hours to design screens for e-Prescribing. In order to electronically route prescriptions to pharmacies nationwide, you must connect to a hub. The hubs have many rules and regulations that e-Prescribing screens must meet in order to connect. Surescripts® (the nation’s largest hub) has strict certification requirements and the certification process can take a lot of time. EHRs must register with Surescripts and take classes, as well as a series of tests, in order to get certified. The process can take upwards of 4 months. An EHR will have a much faster time to market by embedding already certified screens. Adding an eRx system like MDToolbox-Rx can be done in as quick as 2 weeks. The system can be integrated and tested in one week and the next week a quick call (20 min or less) with Surescripts completes the process to go live. Obviously, less time spent on development equals money saved. As mentioned above, in order to e-Prescribe, a lot of data is needed. The cost to acquire and maintain this data can also be quite large and on-going. Databases – MDToolbox maintains over 200 Gigabytes worth of data that needs to be continually updated from many sources. As an example, according to the FDA1, 5 new drug products were approved in October alone. It is not only important to keep data updated to have the latest information available to prescribers, it is mandated to maintain status on the e-Prescribing Network. In order to be certified through Surescripts, you must obtain approved vendor provided databases and update them regularly. Federal, State and Hub Requirements and Regulations - The regulations are continually being updated and new rules put in place which requires constant product and coding updates. E-Prescribing vendors keep up with the regulations and product updates, so EHRs who have integrated with them don’t have to worry about it. These regulations include DEA rules and individual state rules. For example, recently the State of New York passed the “I-STOP” Laws to help the state fight prescription drug abuse. According to a posting at nysenate.gov2, the new laws mandate medication history lookups for controlled substances, mandate ALL prescriptions be e-Sent by March 27, 2015, and updates the controlled substance schedules of many drugs to safer levels. In addition to the lower development and data costs, EHRs can also save big on certification costs. Surescripts® Certifications - The Surescripts certification process not only takes time, it is an additional expense. Thousands of dollars can be saved by embedding an e-Prescribing system that is already certified. As Surescripts® (or other hubs) come out with new rules, changes, and updates, additional product certifications for the e-Prescribing system are required. The process is an ongoing expense. EPCS Certification/Audits - If EHRs want to be able to electronically prescribe controlled substances, they must also go through a full DEA 1311 audit. This can cost upwards of $15,000 dollars. However, if an EHR adds an e-Prescribing system that has already been through the full audit, such as MDToolbox-Rx, this eliminates or greatly reduces the size and price of the audit (depending on type of integration). Additionally, the DEA mandates that the audit be re-preformed every two years and re-audited any time the product is changed, equaling more ongoing costs. Some EHRs may think the ability to create their own screens to match their system outweighs the above benefits. However, a few e-Prescribing vendors allow customization with their screen integrations to allow for a seamless workflow. Such things like the screen colors and fonts can be matched to the EHR's theme. MDToolbox even allows private labeling, so an EHR can add e-Prescribing screens that completely match their current interface and their end users will have no idea that they used an e-Prescribing vendor. So, we pose the question – With the many benefits of using already certified screens AND the ability to customize those screens, why would anyone want to go through the hard work of building and maintaining their own e-Prescribing system? Our post last week covered the top 5 benefits of using e-Prescribing software for providers. If you missed it, check it out here. This week we focus on the benefits as they relate to patients. Most e-Prescribing software includes drug reference information, including leaflets that can be printed and given to the patient (or electronic). These leaflets are often available in several different languages, as well as adult and pediatric forms. They include warnings, possible side effects, how to take the drug, and any other important information the patient needs to know about the drug. Some products, including MDToolbox, also provide patient education information on patient conditions that can be printed and given to the patient as well. An estimated 20% of all paper prescriptions are never filled 1. Eliminating the need to drop off the prescription at the pharmacy and reducing wait times aid in patient compliance. Some providers may worry that the patient may forget to pick up a prescription that was e-Sent. However, software like MDToolbox provides an auto print out of a “Prescription Receipt” that the prescriber can hand to the patient so they remember to go pick it up, as well as which pharmacy it was e-Sent to. The print out also includes the prescription directions so that the patient is clear on how the prescription should be taken. Using e-Prescribing software significantly reduces the time the patient has to wait at the pharmacy and in most cases, the prescriptions are ready for the patient as soon as they get to the pharmacy. Multiple trips to the pharmacy are eliminated and time spent waiting for physicians to reply to refill requests is reduced as well. Through most e-Prescribing programs, prescribers have access to a patient’s formulary information at the time of prescribing. This allows the prescriber to view which drugs will be covered for the patient and which ones are not. Many times co-pay information is also available. This way the prescriber can pick the lowest cost drug available for the patient. A study by Decision Resources found that 75% of the doctors surveyed said when they e-Prescribe they pay more attention to the costs for their patients2. We stated it last week, but it’s worth stating again (and again) because it is so important: e-Prescribing software greatly improves patient safety. Patients who see a provider who uses e-Prescribing do not have to worry about the pharmacist being able to interpret the prescriber’s handwriting. They can be sure that the prescription the prescriber intended to write is readable in a standard, clear format by the pharmacist. MDToolbox even uses tall man lettering, a way of distinguishing look-alike drug names, to maximize the amount of medication errors reduced. A survey by the Institute for Safe Medication Practices (ISMP) reported that 64% of all respondents stated that the use of tall man letters had prevented them from providing the wrong medication3. Through software systems like MDToolbox, prescribers can even access the patient’s medication history available from pharmacies and PBMs, so even if a patient forgets to report a medication they are currently taking, the prescriber will still have a record of it. Having a complete, current medication list is important so prescribers can check for harmful and even possibly lethal drug interactions. Prescribers can check against the patient’s records not only for drug-drug interactions, but also drug-allergy, drug-condition, duplicate therapy, body weight, age, and correct dosing. It’s clear from all of these benefits, e-Prescribing is a great tool to aid providers in giving patients the safe, affordable care they need. Institute for Safe Medication Practices (ISMP) Survey on tall man lettering to reduce drug name confusion. ISMP Med Saf Alert! 2008;13(10):4.